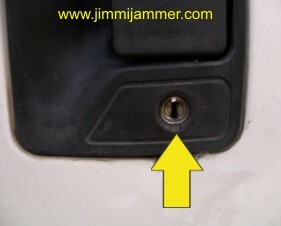 Has your vehicle been burglarized or damaged when a thief attacked the door lock with a screwdriver? Have you had to replace your expensive lock only to have the same thing happen again? What is the PunchPlug™ ? 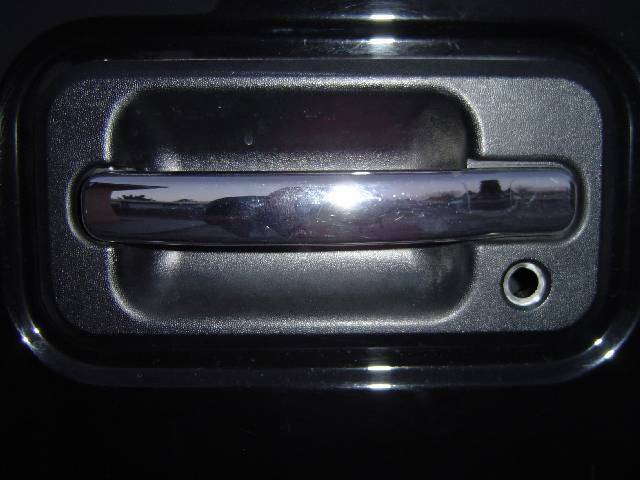 A custom formed steel disc that replaces the lock cylinder in your door handle. Provides a good looking solution to a common problem. The top photo to the right shows an actual door lock that was damaged by a thief. In this case, the thief forced a screwdriver into the lock and stripped the inner mechanism. The door handle was not damaged, but the lock was ruined. The PunchPlug™ replaces the lock, removing the temptation to attack it! lock and stripped the mechanism. 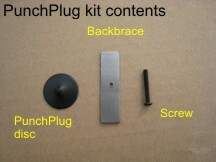 << The photos to the left shows how the PunchPlug™ fills the hole left when the lock is removed from the handle. 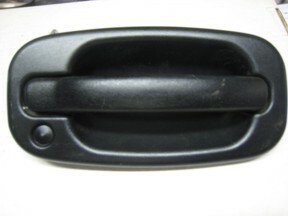 The PunchPlug™ has a unique convex shape that fits nicely inside the door handle lock holder. Looks great! 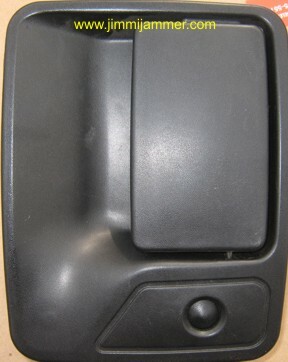 From the outside, the textured finish on the PunchPlug™ blends well with the textured plastic of the door handle. Besides the theft deterrent value, the PunchPlug™ keeps dirt and water from getting into your door. Installation is easy, and once the lock is gone, use your key fob to lock and unlock the door, like you normally do anyway! Above photo shows how the PunchPlug™ is held in the lock holder. The back brace strip uses the lock retaining clip slot and the screw threads in against the PunchPlug™, holding it against the front of the handle. 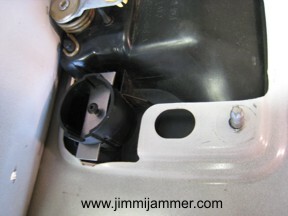 Above photo shows a Jimmi' Jammer® added on after the PunchPlug™ has been installed. Even with the lock removed, thieves know they can get at the latch by prying under the door handle. 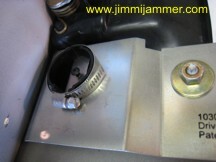 That is why you should add a Jimmi' Jammer® as part of your security plan. One or two PunchPlug™ discs, depending on the model. Standard finish on the PunchPlug™ is textured black paint, closely matching the factory handle. For colored handles, the PunchPlug™ can easily be painted to match the handle using factory touch-up paint. Don't like the idea of removing the lock altogether? Check out our LockCap™ product. We sell all of our products through dealers that can serve retail customers better than we can. Each dealer sets their own prices for our products, so if you have one of our dealers nearby, check with them first. If we don't have a dealer nearby, check with one of our internet based retailers. Not every dealer sells all of our products, but any dealer can order any of our products for you. Sometimes our dealers may not be aware of newer products, such as the PunchPlug™, if you run across this, please have them call us or visit this page! You can also contact us for any questions you might have. Ready to purchase? Find out Where to Buy. Have additional questions? Visit our PunchPlug™ FAQ's page.